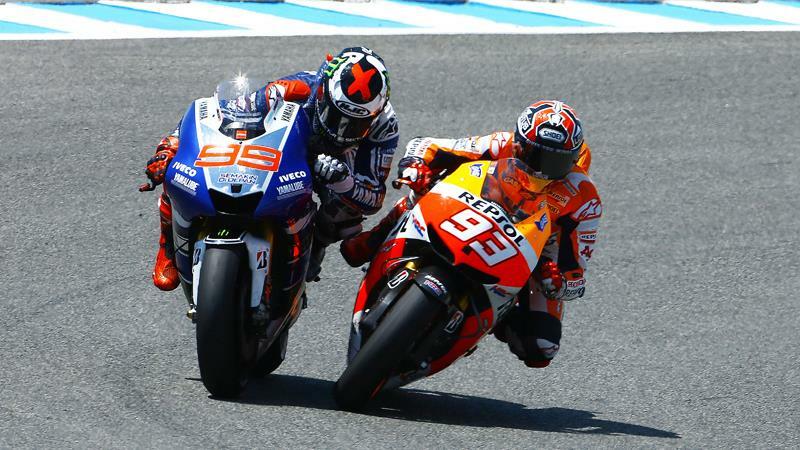 The controversy surrounding Marc Marquez’s last gasp overtake on Jorge Lorenzo in Jerez earlier this month rumbled on in Le Mans today. In the pre-event press conference for this weekend’s French Grand Prix, the final corner in Jerez was a hot topic of discussion after an earlier behind-closed-doors briefing featured the entire MotoGP grid and race officials. Repsol Honda rider Marquez escaped punishment for an aggressive last corner move, which saw him collide with reigning world champion Lorenzo. The clash cost Lorenzo second place and the chance to take the outright lead in the 2013 world championship and he again made it clear in France that reigning Moto2 world champion Marquez should have been punished for the hard move under a new penalty points system. A new penalty points system was introduced for 2013 to clampdown on dangerous and aggressive riding across all three classes after Race Direction came in for criticism for the way various incidents were dealt with and the lack of consistency in the punishments handed out. In Jerez, Race Direction didn’t feel Marquez’s pass had been dangerous and the leniency was much to Lorenzo’s consternation. The Spaniard had sought out a meeting with Race Director Mike Webb, where he made it clear he felt Marquez had overstepped the limit and that he felt the move was worthy of a penalty. Race Direction, a four-member panel led by Webb and also featuring ex-racers Loris Capirossi and Franco Uncini, had spent 30 minutes carefully deliberating the incident. They scoured video footage from numerous angles and the unanimous decision was Marquez was innocent. Immediately after the recent Spanish MotoGP clash, MCN spoke exclusively to Webb, who explained why Marquez had not been penalised. In quotes published in the May 8 issue of MCN, Webb said: “Everyone was in agreement that it was a racing incident. We reviewed all the angles including helicopter shots and lots of things were discussed. But the final and unanimous opinion was racing incident. It was a last corner, last lap incident which we have seen carbon copies of many times in the past. From time to time it is expected that two riders will be in the same turn on an equal level and wanting to take different lines in the corner. Webb acknowledged Lorenzo had made his displeasure apparent in their meeting and he added: “It is very, very obvious that he is completely unhappy and does not agree with our decision. I respect his opinion and I know it is inevitable that his opinion is going to be different to Marc's and our opinion. I wasn't anticipating a protest from Yamaha but I fully understand they are not happy because they missed a position because of a very hard pass." Marquez is no stranger to controversy and his last race in Moto2 in 2012 saw him forced to start from the back of the grid following an avoidable practice collision with Simone Corsi. The Jerez incident heaped pressure on Race Direction given the fact that Marquez was involved and scrutiny on their judgement would arguably be greater with the 20-year-old’s riding under review. Had Webb felt extra pressure because it was Marquez, who has been a frequent visitor to his office in recent years, caught in the eye of the storm? He said: “The answer is no but no one is going to believe me. The second it happens and we start reviewing it for me I am looking at it objectively without personalities involved. At the time it is all about how the race unfolded and what happened rather than past history. I would stress that we cannot allow any rider whether it be Marquez or anyone else to be consistently riding such they are becoming a danger. We won't let that happen. But everyone starts the season with a clean slate and a decision is taken totally independent of history."